The most jarring feature of the Mosquito is the fact that it doesn’t have the traditional heatsink that we’re used to seeing with metal hotends. Generally speaking, hotends like the E3D V6 have a large cylindrical heatsink which is designed to keep the high temperatures of the heater from creeping up and softening the filament before it can be forced down into the melt zone. The problem is that with traditional hotends, the heatsink (and the internal heatbreak) is effectively a structural component. It’s what the heater itself mounts to, so it must be relatively large and heavy. That extra mass means it can absorb more heat, so therefore it needs a way to cool off; hence the fins. When designing the Mosquito hotend [Dan] and co-founder [Chris] wondered if there wasn’t a better way to do it. Rather than attach the heater to the heatsink, the Mosquito simply deletes it. The structural elements of the hotend, what actually attaches it to the printer, are kept separate from the path the filament takes. Since the thin tube containing the filament has very little thermal mass, it doesn’t get nearly as warm. A small fan blowing on the tube is all it takes to keep the filament from softening up. The end result is a hotend which keeps the heat where it needs to be, and everything else cool to the touch. 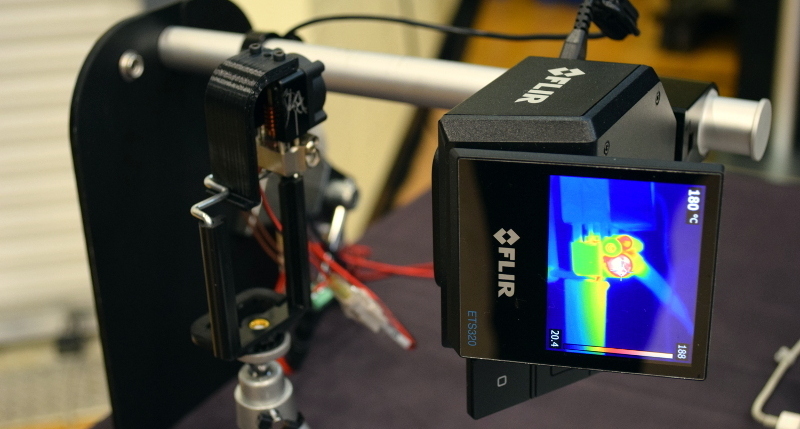 As part of their demonstration, [Dan] had a FLIR camera setup on a Mosquito running at operating temperature; making the sharp separation between the hot and cool sections of the device clearly evident. While the Mosquito might look pretty wild, [Dan] assured us that compatibility with existing printers was always part of the design. The heater core comes in 12 V and 24 V options, and the high performance thermistor can maintain accuracy through the Mosquito’s entire temperature range without having to resort to any kind of trickery like dual sensors. Electrically, the Mosquito is essentially plug-and-play on any desktop 3D printer. Though your firmware may need some tweaking to allow the kind of temperatures the Mosquito can reach. There are a number of common bolt patterns built into the Mosquito, so you should be able to attach it to your existing printer without too much trouble. 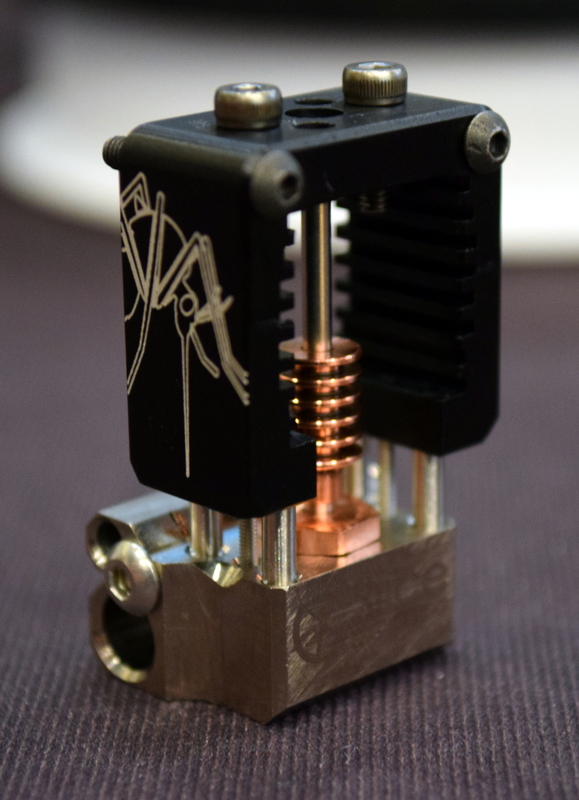 While a Bowden setup might be the most practical given the size and shape of the Mosquito, Slice Engineering has made available STLs for printable adapters that will let users connect their hotend to E3D Titan and Bondtech direct extruders. If there’s one downside of the Mosquito, it’s the cost. Being American made you expect to take a hit in the wallet, but at the current pricing a Mosquito with heater core and thermistor (they have to be bought separately) comes out to $210 USD; three times the cost of the E3D V6. Granted the Mosquito is capable of higher temperatures out of the box. But with supplemental cooling and an upgraded thermistor, the E3D V6 could reach those temperatures and still cost less. Assuming your time isn’t worth anything, anyway. The Mosquito is undeniably well engineered, impeccably manufactured, and arguably more capable out of the box than any other consumer-level hotend on the market. But money talks, and it will be interesting to see if the market will bear an American made “luxury” hotend in a sea of cheap E3D clones. Niche product. No opportunity for economics of scale to kick in. Except when using effective advertising, like roping in HaD to advertise your product for starters. Many time an outsider came in and completely took over a market from well-established players so it’s daft to suggest it can’t be done. Huh, this looks vaguely similar to the hot ends used on the Rapman printers from way back in 2008 from Bits From Bites. Their hot ends used to be $75 before the big companies took them over. So it’s readily possibly for that price to come down. And they work perfectly well ! So, yes made in America, but who would buy that, seriously ??? Please, it’s totally true, it seems like you know better while arguing otherwise. The $70 price is for the genuine E3D v6. Your lower prices are for clones. Also, most of the clones are really a hodge-podge of features found on v5 and older variant v6. In my experience the clones are pretty much as good as the genuine article. Unless the user doesn’t know what they’re doing and habitually blames their bad calibration and settings on whatever latest mod they just bolted on. People rant about tolerances, but come on. It’s a metal tube with a threaded bore through the center and some fins lathed into the outside. It doesn’t need super fancy or expensive manufacturing. I’ve measured them, they’re the same inside and out. Yeah the only rewal thing you have to may attention too is that unfinished mfg of it. But i honestly havent seen it happen often anymore. The early ones often had sharp edges or splited off pieces of metal. I never said that the clones didn’t work. But the blocks are very clearly different. It’s very rare that the clone block replicates the slotted heater clamp on the original v6, in fact I’ve not seen a clone use that, they most often use a set screw to hold the cartridge in place. I’ve yet to see a clone use cartridge temperature sensors. It seems a lot of clones offered use PTFE all the way into to the heat block. Just the smoothness of the bore makes a difference, especially if you want to do cold pulls. Sometimes that difference can be seen, sometimes it can’t. Rene Jurack took a microscope to different heat breaks and found significant differences. With the ginormous chamfer on that clone, I doubt the user is going to be successful at cold pulls. If you are trying to do a super budget build, then yeah, rolling the dice on a clone is fine. Seems like a lot of them recently have had terrible finishing on the interior that has lead to a lot of headaches. At this point I’d rather build a $600 printer with known components shipped quickly and spend my tinker time to get the best prints, rather than kill myself getting a $300 printer just reliably pooping plastic. Interesting design, I’ll be watching for reviews of how it handles in the wild :) That said, there are some 500C hot-ends available from Dyze Design that are in a similar price bracket, even E3D’s copper parts are meant for that kind of use. Speaking of which, I haven’t seen a review for the version of the Dyze hot end revised after Tom Sanladerer complained about it cooking plastic because of an unnecessary void in the heater block. Then there’s the E3D gold edition if you want to declare your lack of taste. :) That thing has terrible color coordination. I hope this survives. Unfortunately, I can’t use this, but I’m glad someone’s trying new things. Unfortunately the status quo is stagnant with the “Mk8” and E3D v6 style hot ends being the norm, and both are rather dated designs. I can’t trust anyone with all their tools racked neatly on the wall. On the other hand, firearms posters and surfboard? Maybe they are OK. This looks like a great move to more top down engineered print head. Light weight and high heat can’t be bad. What is the power and max printing speed. Anyone else notice how seriously cooked the fan housing was in the last picture on their site? That’s not how thermodynamics works. The story would be more credible without that sentence. Exactly. That left me scratching my head too. Less mass = less total heat energy = easier to keep its temperature down. There’s more heat in a gallon of water at 80F than in a cup of coffee at 112F. Heat in=heat out. Heat capacity/thermal mass of the tube has nothing to do with it. If I’m pumping 800 watts into one end of the tube, I have to dissipate 800 watts of energy to stop it heating. It could well be the contact area and conductance are much lower in this design, meaning there is less power transmitted into the filament tube compared to the “traditional” design, but that again has nothing to do with thermal mass. It’s not a constant power regime, it’s constant temperature. You’re not always pumping the same amount of power in constantly. You might have a 40W heater but it’s pulsed such that it might average 5-10W while up to temperature. Small cross sectional area on the filament feed tube is important to avoid melting filament too far up into the feed tube, which is what causes jams. It’s unfortunate the writer couldn’t express this properly. I just realized there’s things I left out but I think a lot of what the Slice team were trying to say. Also, controlling the length of the melt zone is important for consistent melt behavior so controlling how far the heat travels is important. A thin cross section wall plus the fins above it help do that. There’s no way you really didn’t understand this, you’re just looking for something to complain about. With less mass and surface area, the tube doesn’t conduct heat away from the hot zone as much as bigger/thicker designs. It’s also easier to keep cool with the fan blowing on it for the same reasons. Now engineer me a workable, reliable design that has a variable diameter nozzle that can change from 0.05mm to 1mm dynamically as you print and I might throw my money at it. Making one that allows you to go a bit hotter but comes in at ten times the price of a cheap’n cheerful clone is not as interesting by a long chalk. That would be quite a trick. How do you suppose that would work? What’s a good material that’s flexible enough and holds up at a respectable temperature? And will be stable enough to not drift and cause you to over or under extrude? I’m going out on a limb but I doubt you need a dynamically resizing nozzle, and I bet you wouldn’t pay what it costs to make them. A 0.5mm nozzle can be used to extrude a 1.0mm bead no problem. It would be a bit more flow restriction than a closer sized nozzle but it will work. If you want something to change on the fly as it prints, a slicer can hypothetically do that with a fixed nozzle, just change the extrusion rate per mm traversed. It would be nice if more people recognize a niche product for what it is and that being a niche product isn’t necessarily a bad thing, it can still be a success. Higher temperature might not be useful for you but it’s necessary for more exotic plastics. Good designs always start expensive. As they get more sales, prices usually come down with economies of scale, which means more sales. So if the results are there, the price will come down. Remember when E3D was the new kid on the block. Lots of problems until they perfected the design. They always supported their original guinea pig purchasers. So they deserve to be the current pick of the crop! It’s exciting to see a new design. Who will be first to mount on to a Monoprice Select Mini?